If by word or deed, in knowledge or in ignorance they have sinned, or have despised the word of a priest, or are under a priestly anathema, or are fallen under their own anathema, or are bound under oath, do Thou Thyself, as Thou art good and gentle, O Master, be pleased that these, Thy servants, be loosed by Thy word, forgiving them their own anathema and oath, according to the greatness of Thy mercy. Yea, O Master and Lord, O Lover of mankind, hearken unto us who are entreating Thy grace for these Thy servants; and, as the greatly merciful One, overlook all their transgressions, and deliver them from eternal torment. For Thou hast said, O Master, "Whatsoever you shall bind on earth shall be bound in heaven, and whatsoever you shall loose on earth shall be loosed in heaven." For Thou art sinless and unto Thee do we ascribe glory: To the Father, and to the Son, and to the Holy Spirit, now and ever, and unto ages of ages. Saint Gregory, pray to God for us. 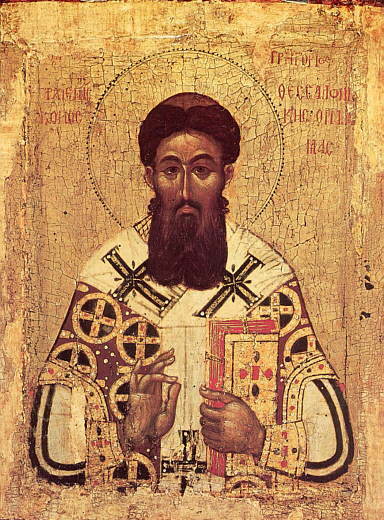 Troparion: Light of Orthodoxy, pillar and teacher of the Church, adornment of monks and champion of theologians, O Gregory, wonderworker and boast of Thessalonika, preacher of grace, pray that our souls may be saved! Kontakion: Organ of wisdom, clear trumpet of theology, Gregory of divine speech, we praise thee. As thou dost stand before the Original Mind, direct our minds to Him, that we may cry: Rejoice, O Gregory, Herald of Grace! For inspiration from the Fathers as well as links to interesting content around the Web, subscribe to our sister page on Facebook.